We both were so pumped for this day! 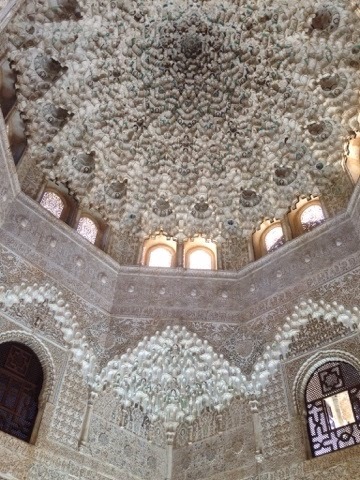 When Dan came back from his trip in 2007 he promised me that he would bring me to the Alhambra! Today was the day that he was going to fulfill that promise to me! 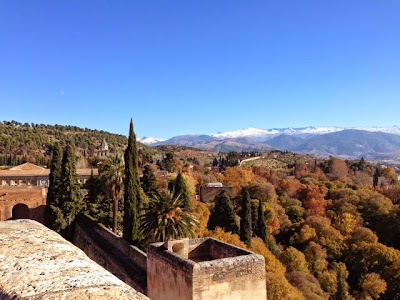 The Alhambra is at the top of a mountain, I highly recommend taking the bus. It’s worth the €1.20 each! Dan walked it in 2007, in August, he said that it was a billion degrees outside. It was a nice day but this pregers was not about to walk up a mountain! We already had our tickets and we knew that we had sometime to see everything else before our set time. Give yourself time to check out the gardens and the other buildings. It’s totally worth it! Even in the off season it still took us four hours to see all of it. Of course, we had brought snacks and took a coffee break. We decided to get sausages again for lunch. We went to a different place this time not as good but still yummy. It wasn’t busy because were are still on North American lunch time and not Spain time. We headed back to the hostel for Dan to work and me to nap. I was worried about being pregnant and walking around all day. Since Dan is self employed he still needs to work a little everyday so this works out well for me! While I was asleep Dan found a place to go for dinner. On tripadvisor it was the number one place so it had to be good. It was Italian, my fav, so worth a shot. Well, it was good but average. The food is made daily including the pasta but they heated it up in a microwave! I was a little shocked by this but whatever. I have come to learn this is a semi normal practice. It was a tiny place and the lady working was lovely. Her English was broken but you could make it out. Spanglish seemed to be working so far! We did a little more walking around before calling it a night. The plan for for today is mainly travel. We headed out to the airport for our flight to Granada. It was a short one and we had no problems. Well, with the traveling part. We were carrying our backpacks and one small suite case on wheels with band stuff. Good thing I was on the ball today because when we stepped off the bus Dan forgot to get it and we had to stop the bus from leaving! That aside we were issue free! We found the hostel with no problems. Dan had got a Euro phone plan for his whole trip and this defiantly came in handy! I highly recommend this especially in those little Euro streets! So with the travelling done we got some eats… Oldy enough we got an awesome flafa and sharwa. The area where our hostel (which was super nice) reminded me of our trip to Rabat but much cleaner. Dan had to work so… me, myself and I ventured out for a walk! Totally crazy for me to do, I stuck to the main streets and found that we were in a high end shopping area. It was busy with people so I wasn’t worry at all. 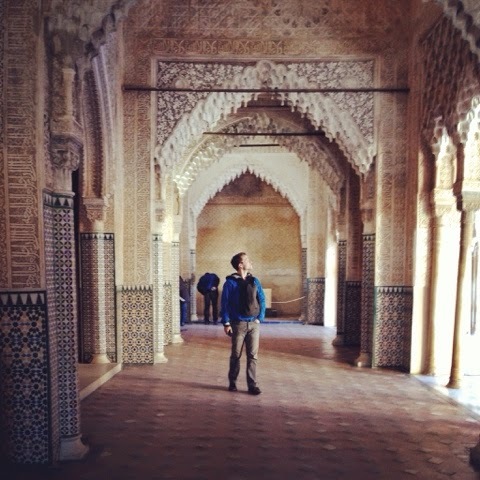 My mission was to get tickets for the Alhambra! I was walking for more then an hour and I knew that I had missed the store. So I headed back to the hostel and there it was! Right at the first corner… Needless to say I was pooped after all of that walking. Got the tickets and headed back to the hostel for a nap. Dan finished up his work and decided to head out himself! Dan wasn’t gone long before he came back to get me. He was seeing some pretty awesome stuff that he didn’t want me to miss out on. We then walked around the streets for an hour! With the help of his phone, he always kind of knew where we were. At the end we came up to a park and sat there for a little and took in the view. It was pretty much at the top of a hill and pretty awesome to take it all in. Lot of locals where up there as well. We came back down and started looking for dinner. 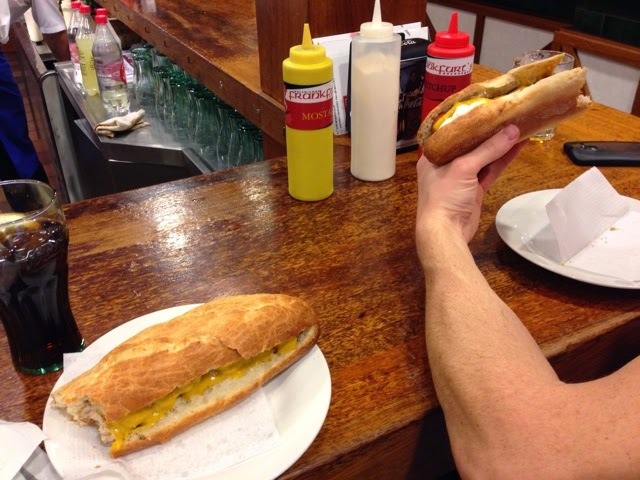 We came across a sausage place that was packed with locals. We knew it had to be good! We just guest at what we were ordering and it was so good! The place was packed with people just standing around talking and having a good time. I can’t think of anything to compared it too. There was nowhere to sit and all the napkins where on the ground with the dishes everywhere. We headed out to see what else we could find and around the corner was fresh doughnuts! Did I mention…made to order! I couldn’t have been happier! Sorry honey, this was the only picture I took inside! It was probably 10 pm and we went back to the hostel for some relaxation. What that really means is Dan needed to work more and I was going to go to bed. I decided to take a look at our reservations for the rest of the week and noticed that I somehow missed a day. 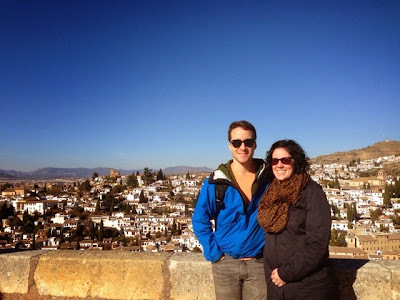 So we decided to stay in Granada an extra night and travel to Seville during the day. It was a pretty low key day but we needed our energy for tomorrow! Alhambra here we come!! In 2007, Dan and some of his friends had come to Spain and he already knew the main highlights. Since we were going to be in Barcelona for only one day we were going to hit up La Sagrada Familia and Park Guell. They are probably the most popular things to do so we tried to get and early start, 11am. Considering we went to bed at 4am – 11am was early!! La Sagrada Familia was crazy from the outside! We did a walk around just to take it all in,then got into line. Since it was December we only waited for about a half hour. The BIG benefit of travelling off season, not that many people around and it was a SUNDAY! I cannot recommend travelling off season enough. I think my favourite part was when Dan was here before the roof was still being installed. So even he was blown away with it (again)! It was nice knowing it was blowing his mind too! Afterwords we walked around a little, got some lunch and headed to the Park Guell. It was actually smaller then I thought but still very cool to think that someone thought about this stuff in the 1800s. We then headed back to the hotel for me to rest and Dan to work. We met with some friends that Dan was doing the tour with to get some dinner. Boy was it a dinner!! We ended up at a place the promoter told us about. It was called Fabrica Moritz Barcelona. 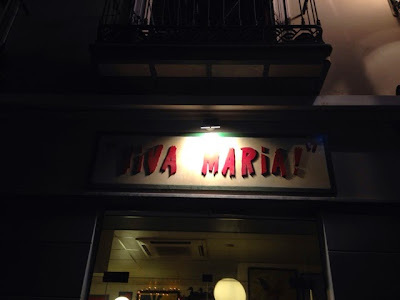 It is a Tapas and beer resturant dating back to 1856 (maybe that is just the beer part). Sadly, I just got to enjoy Fanta (they love Fanta in Spain) and water. The food was so good. The lighting not so much, everything is orange. The Spanish eat late and so did we, not finishing up until 1am. CRAZY! We had to get to bed! Our flight for Granada was leaving 10:45 am the next morning. 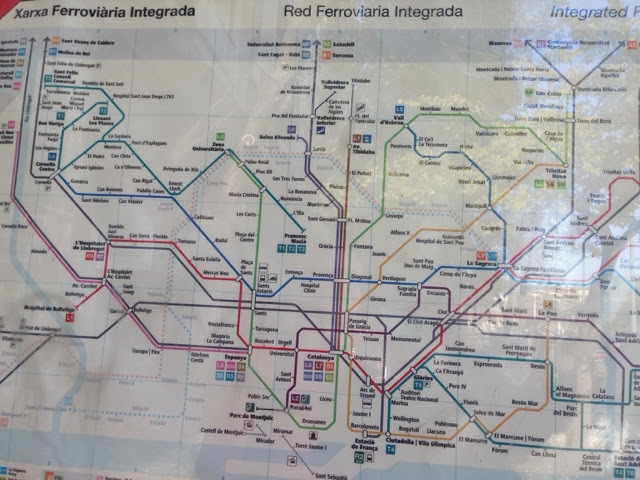 The trip started out with me being nervous about flying by myself and getting around alone on public trans in Barcelona. By the way this started months ago! The night before I was too excited to sleep and I also don’t sleep well on flights so this was going to be interesting. Everything was going great! Got my carry-on in the overhead compartment right over me. Also got my much needed isle seat. The big guy that was stuck in the middle seat was moved so there was extra space to be had. Got to London with no problems! The next two hours is what has been keeping me up at night since planning this trip. I had 1 hour 55 minute before my next flight took off. I speed walked to customs, I knew that I was going to have to switch terminals so needed to get there as fast as possible. I already had my boarding pass for the next flight so I felt like I was in a good position. Customs wasn’t busy! Got on the monorail to the other terminal and went right back through security. No problem! Was this really happening!! Not to shabby for my first time travelling by myself. I was so proud! Now that stressful part was done, I was feeling tried. After all my head thought it was 2am and not 8am. So I got some food and had about 45 minutes before my flight would get posted. I thought I would read a little but gave up really fast because I was too tired. So I was that creepy person that just sat there and listened to all of the wonderful accents around me! I love England! Did I mention that’s where I was getting my connection?! I overhear a women on the phone with her mom saying “everything was on time”. I didn’t think much of it because she could have been going anywhere and maybe where she was going was weather related. The gate gets kinda posted, it was a range of gates. So I headed to another less busy holding area. So there is where all of my good luck started to slow down. No announcements where made about the flight until 15 minutes before it was scheduled to leave. There was a delay. Noticed an another airline had a flight going to Barcelona that delayed by an hour and a half. I had no idea what was in store for me. I wasn’t too worried at this point because getting to the gate was the part freaking me out the most and I was sitting at it! The next two hours are a little blurry for me… so sleepy! We lined up twice and were told that the flight was delayed. Then third time we line up we are actually boarding. Got to Barcelona no problem and I think was asleep by the time the flight leveled out in the air and woke up when we landed. I don’t remember much from the flight at all. I found out later that the issue was air traffic control was done in the UK that morning. So everything was delayed. 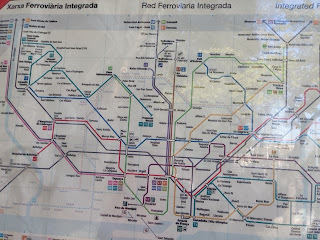 Now the hard part, take the airobus to the subway in a country I don’t speak the language. I did the research before hand and I did it! No problems! So excited! I figured this out all by myself!! I also got to the hotel with pretty much no problems as well. I was finally able to sleep!! I was then woken up by the best thing ever – my husband who I haven’t seen in 2 weeks!! I couldn’t tell you what time it was. All I knew that I had to get ready for dinner because the band promoter was taking us out for an authentic Spanish tapa dinner. Humm, I don’t think I’ve explained why we were on this trip. My husbands band was doing a two week Europe tour and I was meeting them for this last show and we were going on our last vacation just the two of us! The dinner was out of this world! We were in our own private room. Just your average dinner decor! Haha! The food was awesome! I had duck liver for the first time and wished I could have tried the beed tartar but no raw meat for this prego. We then headed to the venue, the famous Razzmatazz, where the boys were going on at 3am (it was currently midnight). I was going to try to make it through and I totally did!! The show was awesome and the crowd was amazing. I even got to see the back stage treatment given to the band! Went back to the hotel for some well needed sleep! Great start to the adventure that was ahead of us! !